UN High Representative for the Alliance of Civilizations Nassir Abdulaziz. Governments and international organizations from around the world reaffirmed their commitment to advance cross-cultural dialogue at the United Nations Alliance of Civilizations Forum, which ended today in Vienna, Austria. The commitment was reaffirmed through the Vienna Declaration, in which participants recognized the importance of increasing cooperation among countries, promoting greater respect among civilizations, cultures and religions, and establishing collaborative links among governments, the private sector, civil society and the media. The Declaration is the result of two days of discussions attended by more than 2,000 people from around the world. During the forum, heads of State and foreign ministers also met separately to discuss pressing global issues such as Syria, Mali, the Middle East peace process and the future of sustainable development. Secretary-General Ban Ki-moon addressed the meeting yesterday and stressed the need for world leaders to promote the principles of tolerance and respect to find durable solutions to conflicts. While in Vienna today, Mr. Ban also met with Austria’s Vice-Chancellor and Minister of Foreign Affairs, Michael Spindelegger, with whom he discussed the crises in Syria and Mali and the urgent need for effective international responses. The two men also exchanged views on the Middle East peace process, the Democratic Republic of the Congo, the Western Balkans and human rights, including the protection of journalists. 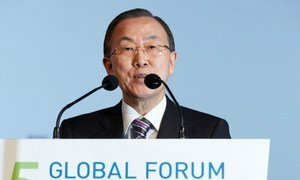 Top United Nations officials today urged world leaders to promote tolerance and respect, adding that these principles can contribute to resolving conflicts, such as those in Syria and Mali, as well as addressing a host of other global challenges.